Recombinant full length protein (Xenopus laevis) - His-tagged and purified from E. coli. Our Abpromise guarantee covers the use of ab4785 in the following tested applications. WB 1/500. 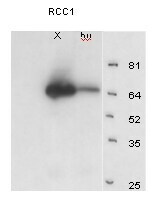 Detects a band of approximately 64 kDa (predicted molecular weight: 45 kDa). Guanine-nucleotide releasing factor that promotes the exchange of Ran-bound GDP by GTP. Involved in the regulation of onset of chromosome condensation in the S phase. Binds both to the nucleosomes and double-stranded DNA. RCC1-Ran complex (together with other proteins) acts as a component of a signal transmission pathway that detects unreplicated DNA. Plays a key role in nucleo-cytoplasmic transport, mitosis and nuclear-envelope assembly. N-terminal methylation by METTL11A/NTM1 is required for binding double-stranded DNA and stable chromatin association. Di-and trimethylation produce a permanent positive charge on the amino group, which facilitate electrostatic binding to the phosphate groups on DNA, while inhibiting histone-binding. Methylated tail helps retain RCC1 on chromosomes during nucleotide exchange on Ran. Nucleus. Cytoplasm. Becomes dispersed throughout the cytoplasm during mitosis. 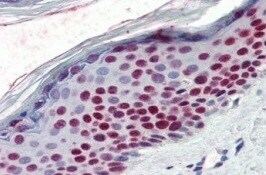 ab4785 (1/100) staining RCC1 in Skin tissue by Immunohistochemistry (Formalin/PFA-fixed paraffin-embedded sections). ab4785 at a 1/500 dilution staining approximately 64kDa RCC 1 in Xenopus egg extract (lane X, 50µg per lane) and HeLa total cell extract (lane Hu, 50µg per lane) by western blot (ECL, 15 seconds exposure). ab4785 at a 1/500 dilution staining approximately 64kDa RCC 1 in Xenopus egg extract (lane X, 50µg per lane) and HeLa total cell extract (lane Hu, 50µg per lane) by western blot (ECL, 15 seconds exposure). ab4785 has not yet been referenced specifically in any publications. Publishing research using ab4785? Please let us know so that we can cite the reference in this datasheet. Could you give me a reply ASAP? Thank you very much! The supplying lab let me know that, unfortunately,they do not have an IP protocol asthe researchers inthe originating lab who tested the antibody in IP haveleft that lab and the records have not been kept. I am very sorry about that. I hope this information is of somehelp to you. Please do not hesitate to contact us if you need any more advice or information.